The Zebra ZXP Series 3 direct card printer is a real workhorse with this professional, yet affordable printer, you produce up to 750 cards per hour in optimum quality thanks to the resolution of 12 dots per millimetre 300 dpi. Its integrated picture processing technology guarantees perfect one or two-sided printing results in vivid full colours on identification, member and access cards or gift cards. Whether photos, text or bar codes - they always look professional and attractive and are ready without delay. The printers extensive coding ability allows for smart card encoding, which covers many application requirements in various business sectors. aThe compact card professional fits into any working environment and is easy to use. The simple-to-change colour ribbon cartridges and the practical 16-character LCD display make the printer extremely user-friendly personnel requires almost no training at all and errors are seldom. Standard, you connect the printer via its Plug Play USB, but you also have Ethernet as an option simply install the Windows-based drivers and get started. Zebra UHF RFID cards - Zebra RFID cards, UHF (ImpinjÂ® Monza 4QT), 30mil, pack of 100pcs. Zebra ZXP Series 3 Ribbon - IX Series Monochrome Ribbon For ZXP Series 3, Black, 2000 Images Per Roll. Compatible With ZXP Series 3. - BLACK Monochrome Ribbon For ZXP Series 3, Black, 2000 Images Per Roll. Compatible With ZXP Series 3. Zebra ZXP Series 3 Ribbon - IX Series Monochrome Ribbon For ZXP Series 3, Silver, High Capacity 1,600 Images Per Roll. Compatible With ZXP Series 3. - SILVER Monochrome Ribbon For ZXP Series 3, Silver, High Capacity 1,600 Images Per Roll. Compatible With ZXP Series 3. Zebra ZXP Series 3 Ribbon - ID Card Ribbons IX Series Eco colour Ribbon (For ZXP Series 3, YMCKO), High Capacity 280 Images Per Roll. - ID Card Ribbons IX Series Eco colour Ribbon (For ZXP Series 3, YMCKO), High Capacity 280 Images Per Roll. Compatible With ZXP Series 3. 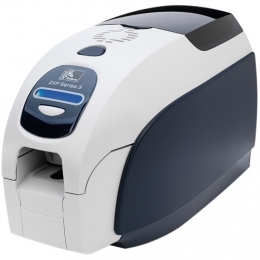 Zebra ZXP Series 3 Ribbon - IX Series colour Ribbon ZXP Series 3, 1/2 Panel YMCKO, High Capacity 400 Images Per Roll. - IX Series colour Ribbon ZXP Series 3, 1/2 Panel YMCKO, High Capacity 400 Images Per Roll. Compatible With The ZXP Series 3.